And check out OUR NEWLY LISTED ITEMS. 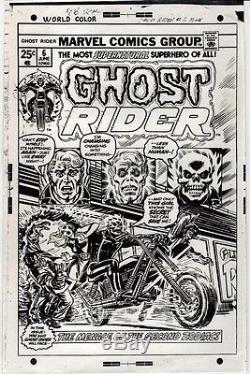 This is an original printed cover proof for Ghost Rider #6, published by Marvel Comics in June of 1974. It is a black and white proof of the original cover art. The proof measures approximately 7 3/8" by 11 1/2", and is on a high-quality glossy-type slick stock material. It is slightly larger than the actual size comic, and is blank on the reverse, with what looks like some printer ink stains, and curling around the edges. It features a classic early GR cover image, with Johnny Blaze transforming into the Spirit of Vengeance, and then riding on his flaming hell-cycle right out of the cover right at you! Please note that this is NOT a mass-produced print or lithograph. It is a cover proof that is created during the production process for the comic. The artwork is by one of the most legendary comic artists of all-time, the brilliant John Romita Sr. Romita is quite simply one of the greatest artists in the history of comics, who is best-known for following Steve Ditko with his own classic run on Amazing Spiderman together with Stan Lee. He has done decades of classic work, from the 1960's, 1970's, and beyond, and has probably drawn pretty much every major Marvel character at one point or another, including Daredevil, Captain America, the Fantastic Four, the Hulk, the Avengers, Thor, the Defenders, and more. This is a very cool and rare comic collectible that you will hardly ever get a chance to see. A great piece which would look fantastic framed and prominently displayed. Please note that this is an authentic piece from the 1970's, not something made for a later reprint or collection book. We have been told there are reprint production art pieces being listed by other sellers that make them seem to be old and from original printings, even though they are not for example, older production art did not have the words on a separate sheet from the images. Those kinds of things were only done much more recently, using computer technology. We advise buyers to be careful, as there are disreputable sellers tricking many people into believing they are purchasing items that are older and more valuable than what they actually are. Some sellers simply do not state their items are from reprints, while others make very long listings and put a tiny mention about reprints buried deep in the listing, and/or use a hard-to-read font color (like yellow) to prevent buyers from seeing this information. Unfortunately, everything else in the listing the title, pictures of the cover of the comic from the 1st printing, etc. This item is a genuine proof from the'70's, not something made for a reprint. Check out our other auctions for more great items. Check it out, you'll be glad you did! The item "GHOST RIDER #6 JOHN ROMITA 1974 ORIGINAL MARVEL COMIC COVER PROOF PRODUCTION ART" is in sale since Wednesday, April 20, 2016. This item is in the category "Collectibles\Comics\Original Comic Art\Covers". The seller is "satchj3" and is located in Brooklyn, New York.